What happens when you don't know what to draw, see an image showing through from a previous page and use it as inspiration? Well, maybe you draw what's inside your head or heart more than anything else. I tried not to question or adjust or be too analytical about what I was drawing - I just went with it. Now that I look at it, it's kind of like a remembering a dream and tracing it's tendrils back to the day before. I was feeling that I was weird and alone. Am I the warrior with the tentacle arm and hand? I was thinking about my ideas and my inspirations, what I like to do and wondering what might come of those projects. Are my inspirations the egg thing with the odd embryo inside? I was thinking about my death and what I'll be to anybody else or the world after that. Is that why I drew the skull? 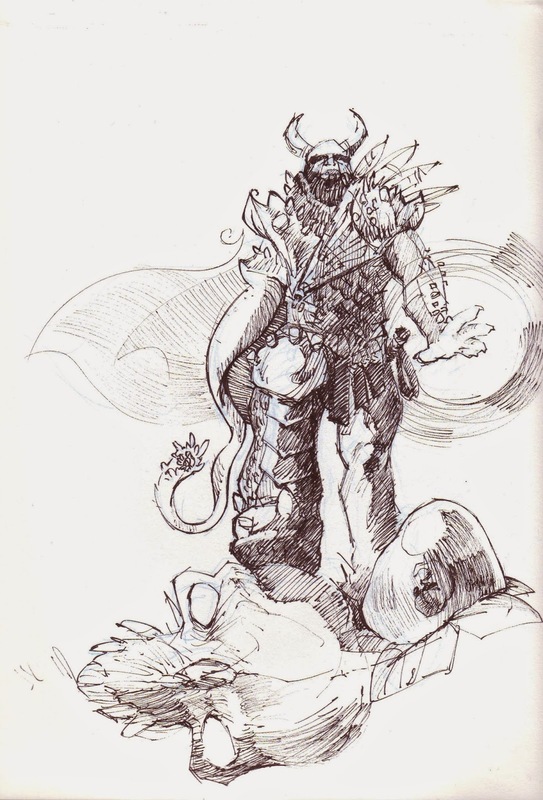 Perhaps every fantasy drawing just needs some warrior standing with his foot on a skull! The only thing the drawing needs is a Megadeath soundtrack! And no, I don't know what Megadeath sounds like, but a name like that, well... did you know Pink Floyd was considering using the name Megadeath? I wonder if that's true. Boy, you're in a weird mood today. And it's produced a... weird drawing! Crazy subject matter, very scattered, but the drawing is as good as it always is. I don't know what Megadeath sounds like, either, but I know a good skull drawing when I see one. That's a good skull drawing! Skulls, who doesn't love a good skull drawing? Word to the wise, if you want a quiet spot to draw and not be bothered with people looking over your shoulder or wanting to talk about the drawing, even if you bring your own headphones and crank the Megadeath, avoid bars.